The Holidays are here, the Holidays are here! I'm sure by now you all know how excited I am for this time of year. With the weather getting colder and the Holidays being near, one of my favorite things to do around this time of year is cook and bake. I'm sure we all can agree that when the Holidays are near, our homes are filled with the delicious smells of food and drinks. One thing that I always use during this time of the year is my crock-pot. It's amazing what one pot can do when you put all your ingredients in it and let it sit for hours. You come back to a delicious meal that's better known to my family as comfort food. I love making any of everything in my crock-pot, from stews to warm beverages, this pot will be a constant in our home over the next few months. Not only do I love using my crock-pot during the Fall and Winter, but I also love to bake. Baking delicious treats for my family and friends to enjoy. It brings a smile to my face when I'm able to bake and give it away as a gift to a family member, friend or neighbor. The kids don't seem to mind it too. They love coming home to a new treat after school. Want to create and enjoy some amazing meals this Fall/Winter too? Be sure to check out DK Canada. Right now they have a 30% sale on their books in their Food and Drink Boutique. A few weeks ago I was given two amazing cookbooks that I've already enjoyed using and can't wait to continue using them. 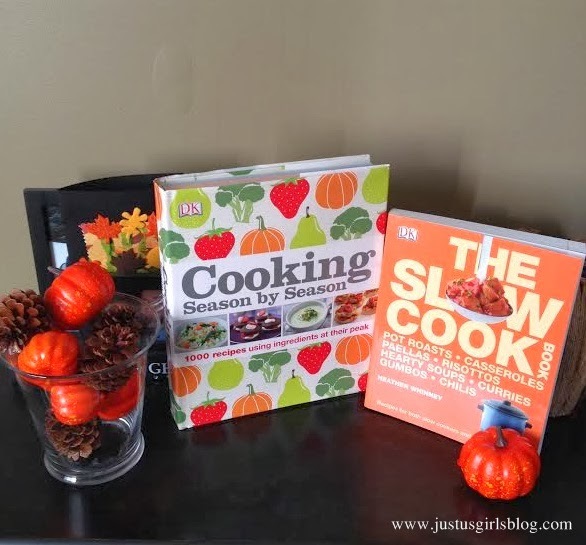 I got the Cooking Season by Season book and also the The Slow Cookbook. Both are perfect for this time of year. The Slow Cookbook is filled with over 300 pages of different amazing recipes you can use for your crock-pot and the Cooking Season by Season book has something any time of the year. I love that it's broken up into sections so that you can find what's perfect for any and all occasions no matter what month it is. The Food and Drink Boutique sale is only for a limited time, be sure to get these amazing books on a 30% discount while you can!